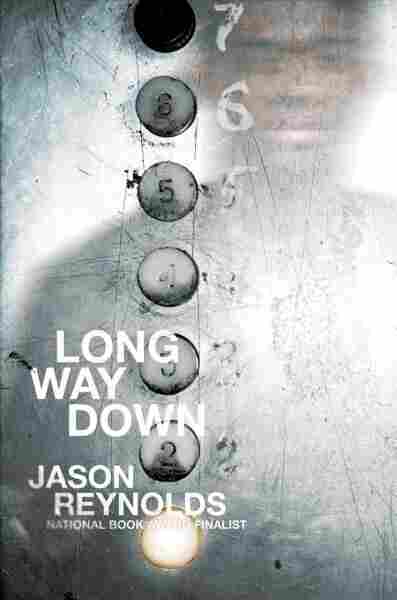 In 'Long Way Down,' The Ghosts Of Gun Violence Chill A Plan For Revenge Jason Reynolds' new book follows a 15-year-old who must make a crucial decision after the murder of his brother, all in the time it takes for an elevator to travel 60 seconds to the ground floor. Jason Reynolds' new novel Long Way Down is focused on a moment of decision. It happens in an elevator — teenaged Will is on his way to take revenge for the murder of his brother, but his plan is interrupted by a few visitors on the way down to the ground floor. "Will is growing up in a community where there are certain rules," Reynolds says. "There's a code of conduct, and what those rules are is number one, no crying, number two, no snitching, and number three, always seek revenge." Those rules ring true to Reynold's own experience: At 19, one of his best friends was murdered, and he considered revenge himself. "I'm grateful that we didn't do the thing that we thought we were going to do," Reynolds says. "When you start to sort of work through those things and you come back to reality ... you're, like, 'Whoa, my entire life could have changed.' "
What I wanted to do in telling a tale about gun violence is not create one-dimensional characters that fall into cliches, and so I think what we can do with devices, like using ghosts of the past, is we can create a space where the writer, the author — quote-unquote me — doesn't have to teach a lesson. Instead, it's about us, a community, thinking about those of our family members and our friends who we've already lost to this thing, and allow their haunting to be the thing that creates our psyche and our conscience. One, that young people who engage in this, especially the back and forth, the revenge, that there is a fearlessness, that these young people are sort of without feelings, without emotion, that they're cold as ice, right? The truth is that everyone who's ever been around anyone who has been in these environments knows that the people who pull the triggers are terrified. I was 19, I got a phone call at two o'clock in the morning from one of my best friends, who informed me that another one of our best friends was murdered ... the news hit like a Mack truck. I'll never forget the next day, being at his mom's house, overrun with anger and having to admit to myself that in that moment, I was fully aware that we could all leave that house, go in search for whoever we think may have done this, and end their lives. And that I would have been able to go home that night and sleep like a baby. Because what happens is when you feel that kind of pain, time suspends itself, and you believe that you'll be 19 forever, you believe that the way you feel in this moment will last forever. And I remember his mother standing in front of us and telling us that no other mother needs to feel what she feels in that moment, and because of respect for her, all of us sort of standing down. ... when you feel that kind of pain, time suspends itself, and you believe that you'll be 19 forever, you believe that the way you feel in this moment will last forever. I need my young brothers who are living in these environments, I need the kids who are not living in these environments to have no excuses not to read the book. The truth of the matter is that I recognize that I write prose, and I love prose, and I want everybody to read prose, but I'm also not — I would never, sort of, deny the fact that like, literacy in America is not the highest, especially amongst young men, especially amongst young men of color. It's something that we've all been working very hard on, and my job is not to sort of critique or judge that. My job is to do something to help that, and to know you can finish this in 45 minutes means the world to me, so that we can get more young people reading it and thinking and having discussion about what this book is actually about. This story was edited for radio by Justin Richmond and Jacob Conrad, and adapted for the Web by Sydnee Monday and Petra Mayer.